Lot of (50) wedge anchor bolts. Nuts and flat washers are included. Red Head WS-1236 Trubolt Wedge Anchor 1/2" X 3-3/4" Lot of 25 ! NEW ! Fischer FAZ-II-8/10 Bolt Anchor 50/Pack ! NEW ! Red Head WS-3822 Trubolt Wedge Anchor 3/8" X 2-3/4" Lot of 25 ! NEW ! Red Head 52009 Trubolt Wedge Anchor 1/2" X 2-3/4" Lot of 25 ! NEW ! 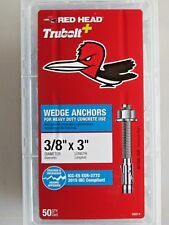 Red Head GWS-1226 Trubolt Wedge Anchors 3/8" 10-Pack ! NOP ! Lot of (6) wedge anchor bolts. Nuts and flat washers are included. Item weight: 13 Lbs. Red Head WS-5842 Trubolt Wedge Anchor 5/8" X 4-1/4" Lot of 10 ! NEW ! These hot dip galvanized anchors are 3/4-10 thread and are 12" in length (inside bend) with a 4" thread length and 3" L (inside bend). Lot of (5) bent anchor bolts. 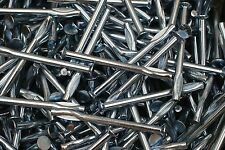 50 Pc - 1/2" x 1-1/5" Zing Alloy Anchors. Zinc plated finish to resist rust and corrosion. Red Head Concrete Wedge Anchors. We will work with you. You deserve to be treated with 5-Star Service! Allow us the opportunity to correct any mistakes that may have occurred. We look forward to serving you. These zinc alloy anchors are designed for a 1/4" drill hole and are 2" in length with a zinc plated steel pin. Lot of (100) pin anchors. Item weight: 3 Lbs. What's in the Box: 10 Trubolt Carbon Steel Wedges. Dependable, heavy duty, inspectable, wedge type expansion anchor. Made of zinc-plated carbon steel. Check back daily for new deals! This item is new and has not been used. 30 Pc - 1/2" x 1-5/8" Plastic Anchors. Plastic to resist rust and corrosion. 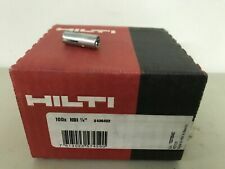 BOX OF 50 CONCRETE LEAD ANCHORS FOR LAG SHIELDS. 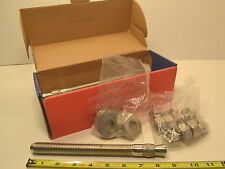 Festo ZBH-9 Centering Sleeve 150927 ! NOP ! Lot of (8) wedge anchor bolts. Nuts and flat washers are included. Lot of (40) wedge anchor bolts. Nuts and flat washers are included. 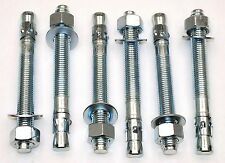 These galvanized anchors are 1/2-13 thread and are 8-1/2" in length. Lot of (10) wedge anchor bolts. Nuts and flat washers are included. These hot dip galvanized anchors are 1/2-13 thread and are 10" in length (inside bend) with a 4" thread length and 1" L (inside bend). Lot of (15) bent anchor bolts. Remove the drive tool and pull up on the cable to set the toggle. The upward pull rotates the Earth Anchor into a perpendicular lock position allowing it to firmly secure your item to the ground. These zinc alloy anchors are designed for a 1/4" drill hole and are 1-1/2" in length with a zinc plated steel pin. 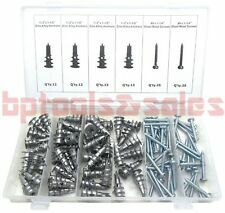 Lot of (150) pin anchors. Item weight: 3.5 Lbs. Lot of (6) wedge anchor bolts. Nuts and flat washers are included. 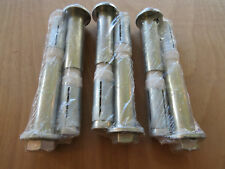 These zinc plated anchors are 3/4-10 thread and are 10" in length. LOT of 8 Masonry Wedge Bent Anchor L Angle BOLTS 3/8" Thick Steampunk 8" & 6"